Nova DCP-FS is a resin-modified emulsion product that provides a high performance treatment solution for unpaved road surfaces. 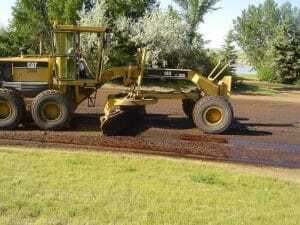 It works as a dust suppression product and provides surface stabilization for roads. Formulated from tree resin ingredients, this state-of-the-art, non-ionic emulsion technology is unique in its high bonding strength and is appropriate for use even in close proximity to wetland areas and other areas of environmental sensitivity. DCP-FS is our signature DCP-C dust control product, pre-blended with water at a rate of 50/50 for convenience in the field. Dusty roads deteriorate quickly and once the fine material is lost, the load-bearing aggregate will soon follow. Loss of fines and aggregate results in ruts, potholes and washboards that require costly spot repairs and frequent grading to keep the road in acceptable condition. High volumes of dust in local residents’ homes, reducing quality of life and increasing chances of developing respiratory health problems. Nova DCP-FS has been specifically designed and has proven to be a long-term solution for efficient control of road dust. Whether you are creating a landing strip, access road, haul road, hardened surface, trail or need to control erosion, Nova DCP-FS is a reliable, environmentally friendly dust control chemical. Contact us today to find out how Nova DCP-FS dust control chemical can help you!